Use the learning from your work experience, on-the-job training, and other courses to finish your undergraduate degree in record time and at reduced cost! ► Complete your degree in less time and at less cost! ► Stay at home, work, and even a hotel room and go to classes–online! How? Enrol in the online Prior Learning and Portfolio Development/Assessment course. A Course Coordinator will assist you to develop your personal experiential learning portfolio. Your learning may be a result of your work experience, on-the-job training, and volunteer work, attending training seminars, workshops, and completing other courses. Trained subject content experts will assess your portfolio. Through PLA, you can gain credits with associated exemptions and advanced placement in an undergraduate programme. ■ BSc Youth Development Work. For further information, please click here to complete the PLA form. 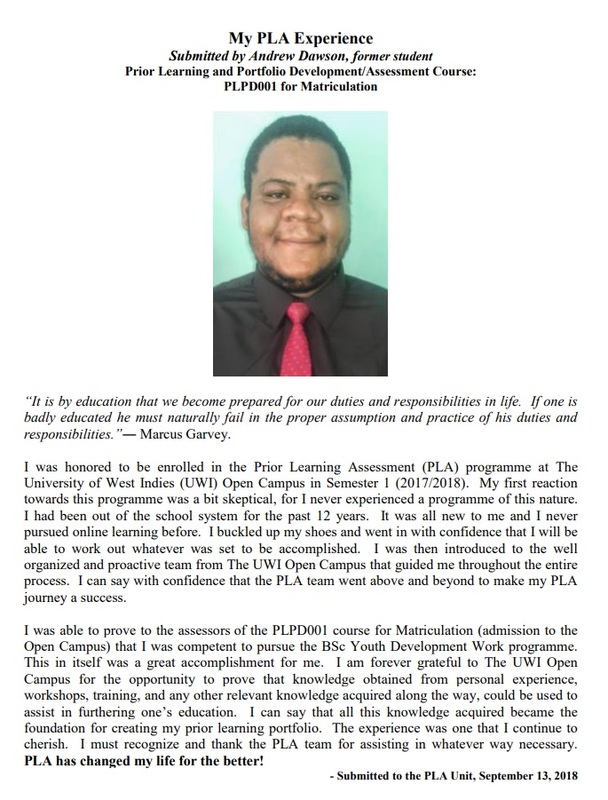 The UWI Open Campus (UWIOC) supports Prior Learning Assessment (PLA) because learning takes place everywhere – in formal, non-formal and informal situations. 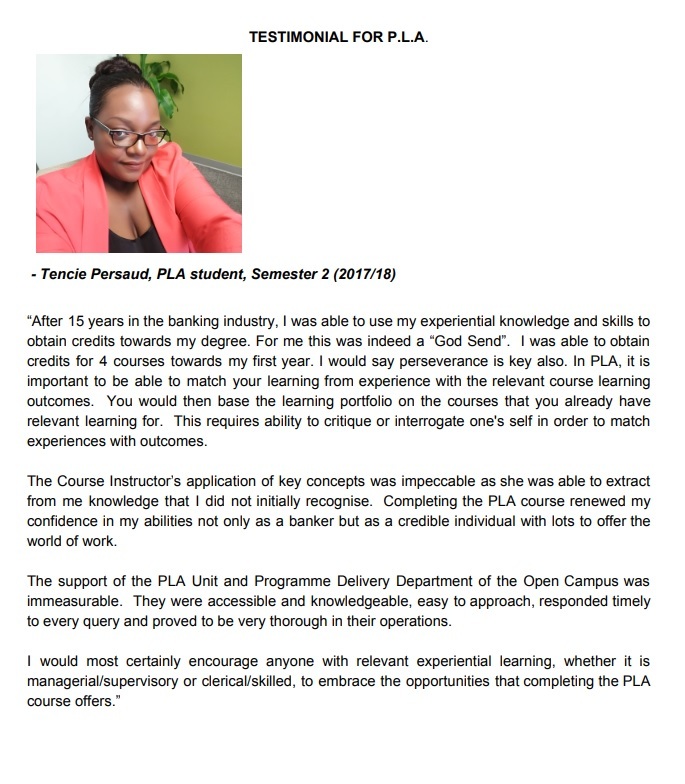 The UWIOC, like many universities globally, uses the PLA method to assess your work experience, on-the-job training, and other courses to determine how it compares with the learning outcomes that the UWIOC developed for some programmes. Once the assessors agree that your documented experiential learning matches the learning outcomes of the courses you selected, academic credits will be recommended for advanced placement in your degree programme. Different countries refer to PLA differently. Depending on the location, PLA maybe called: Assessment of Prior Learning (APL), Recognition of Prior Learning (RPL) or Prior Learning Assessment and Recognition (PLAR).